EIZO Rugged Solutions Inc., a provider of ruggedized graphics and video products, has released the Talon Series – a new brand of rugged monitors developed specifically for operation in harsh environments. The line-up includes the 24.1" RGD2401W, 21.5" RGD2101W, and 20.1" RGD2001. All three monitors boast ruggedized features and can be customized to meet user needs. In settings where mission-critical tasks are carried out, the reliability of a product is paramount. EIZO designs, manufactures, and tests its rugged monitors in-house in order to ensure a high-quality product designed specifically for the task. This means total control over production for quality materials and extended lifecycle support. Furthermore, with comprehensive testing at EIZO’s own test center for MIL compliance, the monitors are made to last. 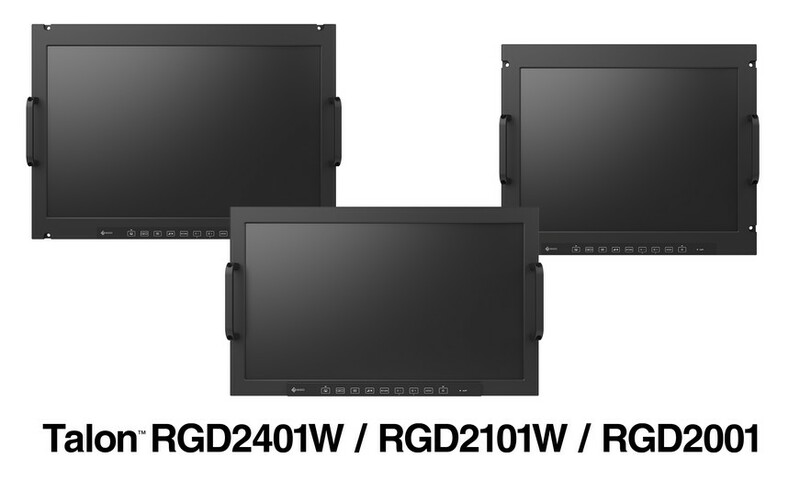 Currently three standard COTS rugged monitors are available in 24.1", 21.5", and 20.1" sizes (RGD2401W, RGD2101W, and RGD2001 respectively). These MIL-STD-810, MIL-STD-461 and IP65 compliant monitors also feature optical bonding, which protects the LCD panel while improving visibility in bright environments. With a long-lasting LED backlight and less than 1 cd/m2 minimum brightness, the monitors can be comfortably viewed in the dark. The monitors also come standard with a multitude of inputs, including 3G-SDI, DVI, RGB, USB, and Serial communication to ensure seamless connection with most peripheral devices and systems. Talon monitors are 19" rack mountable for flexible installation. For over 50 years, EIZO has been designing and manufacturing reliable, high quality monitors for several vertical markets such as maritime, ATC, healthcare, and security & surveillance. With this experience EIZO is able to respond to the niche demands of the rugged market through extensive customization. Talon monitors can be built with diverse panel sizes, customizable monitor housing, protection against low temperatures, and NVIS. Optional image enhancement technology is also available, which adjusts dark or foggy images pixel by pixel for a clearer and easier to see picture in real time. Touch screen options include projected capacitive (PCAP) touch with 10-point multitouch (RGD2001 and RGD2401W), or analog resistive touch (RGD2101W). EIZO will be showcasing its Talon Series monitors in booth #1616 at SAS (Sea Air Space) from May 6-8 in National Harbor, Maryland, USA and booth #1351 at SOFIC (Special Operations Force Industry Conference) from May 20-23 in Tampa, Florida, USA. For more information on the Talon Series or any other product from EIZO Rugged Solutions, please visit www.eizorugged.com, email talon@eizo.com or call +1 (407) 262-7100. EIZO Rugged Solutions Inc. has been developing graphics and video solutions for air traffic control, military, and embedded applications for over 30 years. The ISO9001:2015 certified company offers a range of commercial off-the-shelf (COTS) products, including graphics processors targeted at GPGPU applications, video input solutions, video compression and streaming boards, imaging cards, recording solutions, and software libraries. The company designs and manufactures its core MIL-STD-810G graphics and video products in the USA and serves customers in defense, security, aerospace, avionics, transportation, maritime, and industrial markets. Talon is a trademark, and EIZO and the EIZO Logo are registered trademarks of EIZO Corporation in Japan and other countries.